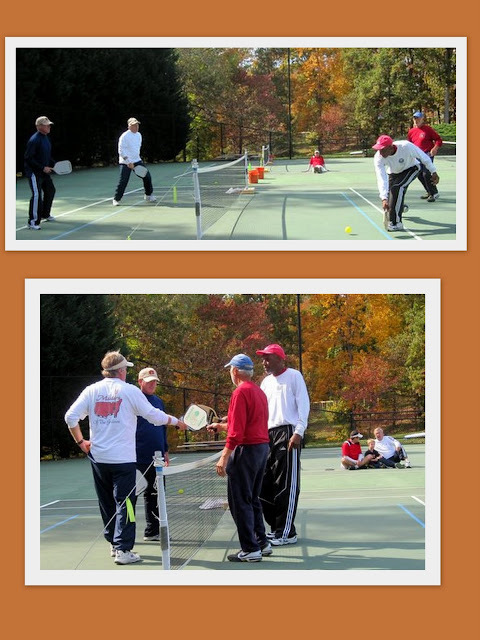 Pickleball tournaments hosted and directed by Tom and Ann Earley and the North Georgia Pickleball Club are known to be some of the very best in the ASR, and this year's Halloween Pickleball Benefit Tournament, held on Saturday and Sunday, October 29th and 30th, was no exception. Participants received the crimson long-sleeved tournament t-shirts, breakfast pastry,fruit, and juice, and a hearty three soup lunch with hot, fresh bread (made by Tom Earley each morning). The award winners received truffles made by local chocolatier: LynnWingfield's "Chocolate Fix". According to Ann at the end of day one, it was a .."Great day for Pickleball - if we could have eliminated the wind factor!" Today's Pickleball teams came from Lake Arrowhead (Lana Chadwick,Bill and Carol Hess), Chattanooga, TN (Dennis Hart, Kirstin Beasley),Woodstock, Canton, Marietta, Dallas, and Acworth. "There was a presentation of $500.00 from the tournament players and the North Georgia Pickleball Club to Ottis Moore of the Cherokee County Humane Society. Another contribution was made to the Air Warriors Jr. ROTC of Teasley Middle School. The Air Warriors gave a rifle presentation and led the grand Opening Ceremony with their flag corp. Tenor Ken Terrell sang the National Anthem and the games began." sports to drive 4+ hours for a bag of "treats"! (Marietta, GA) ....."Bocce, the official Atlantic South Region Pickleball Mascot, was in attendance during the tournament as line judge. He was also quite impressed (as you can see below) by the winners of the "most improved" on Sunday (4.0-4,5 skill level). Or did he actually want their yodeling pickle ? Mark Morneau (Michigan) and Buzz and Jason Ahrens (Canton, GA). And finally - pictured below , with THREE generations of Pickleball Players is the Morneau family. Pickleball players - Michigan resident Steve Morneau (white shirt), Jane and Mark Morneau, parents of Jensen (3) and Tanner (5). Pickleball certainly is a game for the whole family - no matter what your age may be!! A special thank you to everyone who helped Tom and Ann make this tournament a success! Mark and Kate Perrie (Arizona) - Court Preparation, covering the courts, taping the edges and aligning "drainage" boards. David Barron - Helping to tap re-tape the courts and for the supply of water for the tournament. Lana Chadwick, Don and Regina Lucas - Additional Humane Society contributions. Jenn and Dawn Barron who shuttled ice to the giant cooler with water on the tournament days. Another great Pickleball family who recently moved to Georgia from Arizona! Canton Holiday Inn Express for accommodations for our Tennessee and Alabama players. Lynn Wingfield/"Chocolate Fix" for the Awards.